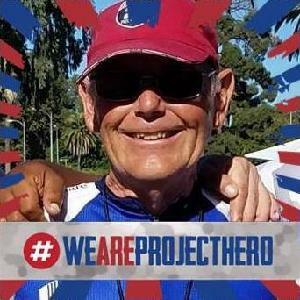 I'm a civilian cyclist whose first contact with Project Hero was over six years ago at an Honor Ride in Las Vegas. Within a year, I was drawn into riding with local participants as they trained together for upcoming events. I was welcomed into their community and began to witness some of the healing taking place. As my involvement increased, I was asked to join the team of Project HERO representatives whose main task is to train with riders at the grass roots level. And so Project Hero HUB San Joaquin was born. Honor Rides are one-day events where the public is invited to ride along with these "healing heroes." There are also multi-day Challenge rides that we prepare them for. And it has been my privilege and honor to to ride with some of them on Challenges in California and Texas. Show your support of Project Hero's incredible veteran recovery, rehabilitation and reintegration services. I am raising funds so that more injured veterans can participate in these low-cost, life-changing programs and improve their mental and physical health and wellness. Your donation will help us save lives by restoring hope and purpose for our nation's healing heroes. For event details, visit the home page. For more information about Project Hero's life-saving veteran programs, check out their website.